Preoperative photographs of a patient with fracture of the right orbital floor and medial wall. 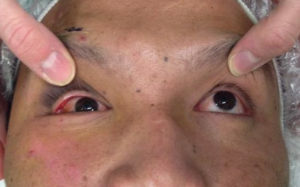 Frontal view shows restricted upgaze of the right eye indicative of muscle entrapment. “Worms eye” view shows significant enophthalmos of the right eye. The shape of the orbit is similar to a pyramid, with its base at the front and four walls converging towards a point behind the eyeball. The thinnest and most commonly fractured bones of the orbit are the floor and the medial wall (the side closest to the nose). 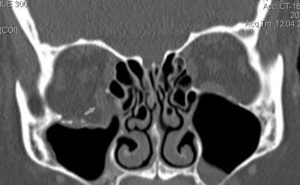 Both of these walls separate the socket from air-filled sinuses, so if the fracture is large enough, the orbital tissues can bulge (herniate) into the adjacent sinus. 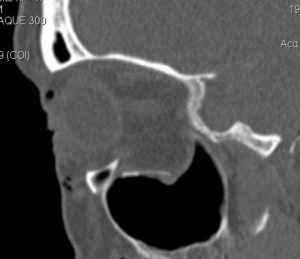 Orbital tissue herniation causes most of the problems associated with orbital fractures. 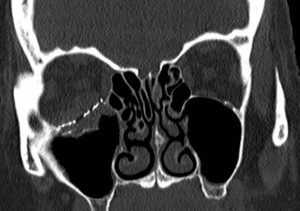 CT scan showing large fracture of the right orbital floor with herniation of the inferior rectus muscle (arrow) into the maxillary sinus. One common issue caused by orbital tissue herniation is double vision (diplopia), due to imbalance of the muscles that move the eye. Diplopia can be caused by direct injury (contusion) of the muscle from the same impact that caused the fracture in the first place. In such a situation, only time can determine if the muscle will regain its strength – repairing the fracture will not make the muscle heal any faster. Another cause of diplopia is indirect traction on the muscles from herniation or entrapment of the soft tissues connected to the muscle. In these cases, the double vision is often only present when looking up, down, or to the sides, and it can sometimes improve on its own over time. The most serious cause of diplopia occurs when muscle gets entrapped by or impaled on bone fragments. This is much more common in children or young adults, whose bones are not as brittle as older people’s, and the fractured orbital bone can bend to form a “trap-door” which pinches the muscle between two pieces of bone. Unlike most orbital fractures, which can be safely observed for several weeks or longer, trap door fractures must be repaired within a day or two to prevent permanent muscle damage. Another common problem caused by orbital fractures is a sunken appearance of the eye, for which physicians use the term “enophthalmos.” This occurs when enough orbital tissue bulges through a fracture into the adjacent sinus to cause the eye to sink back into the socket, or sometimes even downwards, in the case of large floor fractures. While enophthalmos does not affect vision, it can alter a patient’s facial appearance enough to warrant reconstructive surgical repair. It is important to emphasize that not all orbital fractures need to be repaired. As long as muscle entrapment is not present, it is perfectly acceptable to observe a patient for several weeks to see if double vision improves on its own, or if enophthalmos develops once the orbital swelling from the initial trauma subsides. 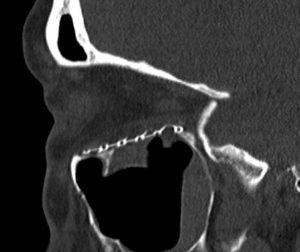 Some surgeons recommend early repair if a fracture looks large enough on CT scan, but this is largely a matter of preference. During the waiting period, some doctors prescribe steroids and/or antibiotics. This is also a matter of preference and some patient-specific risk factors. Orbital blowout fractures are repaired by surgically entering the orbit, repositioning the herniated tissues, and covering the bony opening with a thin implant. Available implant materials vary widely, and they all have their own advantages and disadvantages. Far more important than the type of implant is the use of sound surgical technique when exposing the fracture, repositioning the tissues, and placing the implant. Orbital surgery is inherently difficult because it is performed within a tight space around the eye and other vital tissues. Hence, proper training and adequate experience are critical for any surgeon undertaking orbital fracture repair. If you or a loved one are considering an orbital procedure, make sure you fully understand why the surgery is needed (i.e. the “indications”); ask to see your CT scan and have your surgeon explain the anatomy; ask about choices in surgical approach and implant materials; if you have diplopia, ask whether it is caused by direct muscle damage (which will not be addressed by orbital surgery), muscle entrapment, or soft tissue herniation; and make sure you understand the potential complications of surgery, including double vision, loss of vision, facial deformity, facial numbness, and eyelid problems. Additionally, if your surgeon is not an ophthalmologist, make sure you undergo a complete ophthalmic examination prior to surgery, including eye movements and measurements of eye position using an exophthalmometer (also known as a “Hertel”). Postoperative CT of same patient showing fracture repaired with titanium/porous polyethylene implant. Many different types of specialists undergo training in orbital surgery, including general plastic surgeons, otolaryngologists (ENT specialists), oral maxillofacial surgeons (OMFS), and oculoplastic surgeons. The membership of NASAOS is committed to promoting the highest possible quality of care provided by all orbital surgeons within its sphere of influence, inside and outside of ophthalmology.